Poodleism: Spring Fashion Standouts...love/hate for this girl. Spring Fashion Standouts...love/hate for this girl. Most days I peruse the various offerings on New York Magazine's website. There, I find a happy variety of political, world, entertainment and fashion news. That's also where my favorite Gossip Girl recap is housed. I can almost always find things I love there. That's not even to mention the longer features and reporting. I wandered over to fashion today, something I reserve for days when I extra want to look at pretty things, if I go there daily it doesn't seem as sparkly. The experts there have summarized spring fashion trends into 4 major standouts. I'm ahead of the trend on a couple of these. BOOM. 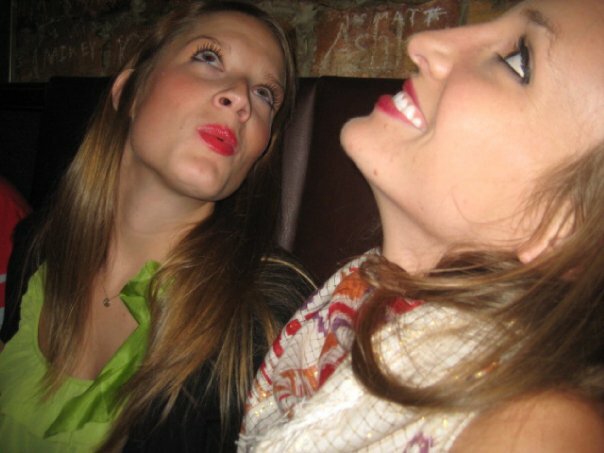 Others, I'm not so sure about... RED LIPS. These never go out of style in my book. I love red lips more than I love any other beauty item. I try to incorporate them as much as possible without looking like a total harlot. To me this is just an acknowledgment of what I already know to be awesome. ORANGE. ("Whoever said orange is the new pink was seriously disturbed." -- Elle Woods.) I don't exactly agree with Elle on this one (although that's rare). I think orange is springy and fun. I loves it. See birthday dress from a few weeks ago. 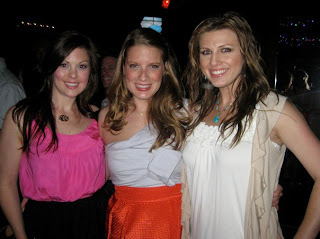 Dress doesn't quite upstage my friends' smiling faces, but you get the point. 'CIRCUS ON YOUR FEET' SHOES. Jigga what? Luis Vuitton is responsible. I'm confused about these. 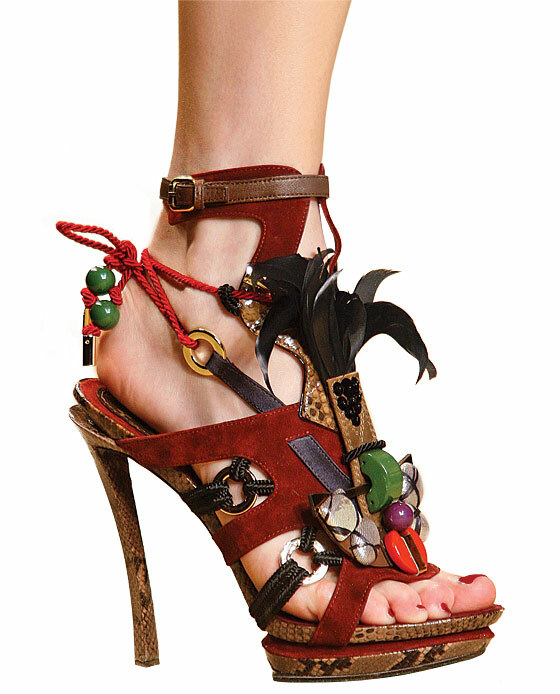 You have to admit, they have it all: feathers, gemstones, strings, straps, beads, snakeskin, platforms, suede. I'm sort of on sensory overload, and its just a visual experience. I'm going to give these two whole-hearted thumbs downs. Sorry Louis, I still love you. I think I prefer these Louboutins. Isn't "let's pretend we can buy these" game fun? SPACE PURSE. 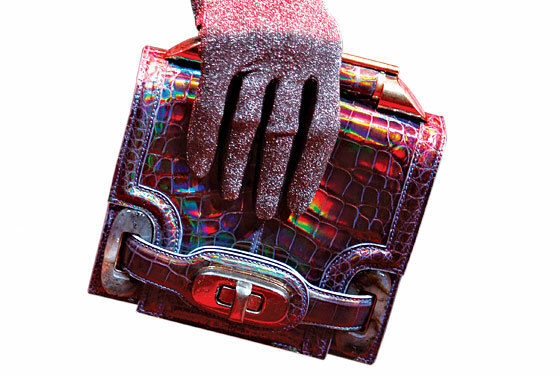 I may be distracted by the sparkle hand, but something about this Balenciaga bag just screams "clutch from the future to me." Don't know if I'm crazy about the irridescent-ness. Or that this is described as a "perfect expression of the genre." I like this one better. 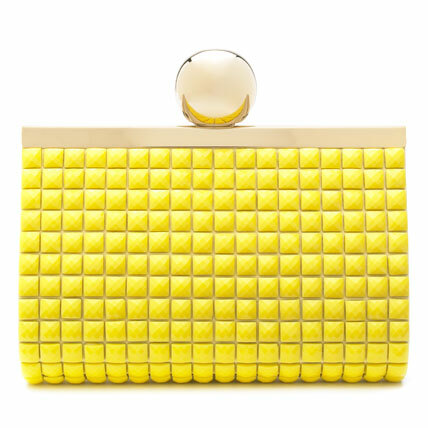 Surprise, it's Kate Spade! Yellow is new for me. I'm trying to expand my palette. It's occurred to me lately that my closet is too purple-heavy. Shocker. Happy fashion dreamland. Oh, how I love thee. Just discovered your blog! Very cute! Love the 'space purse' verbage!!! My new favorite word combo! love the choice photo from your B-day!